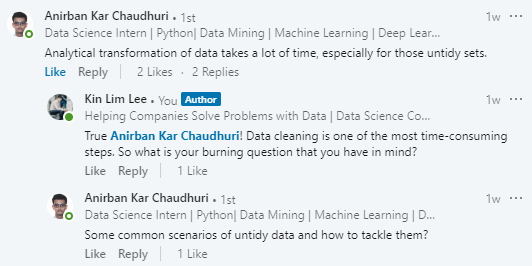 In one of my articles—My First Data Scientist Internship, I talked about how crucial data cleaning (data preprocessing, data munging...Whatever it is) is and how it could easily occupy 40%-70% of the whole data science workflow. The world is imperfect, so is data. 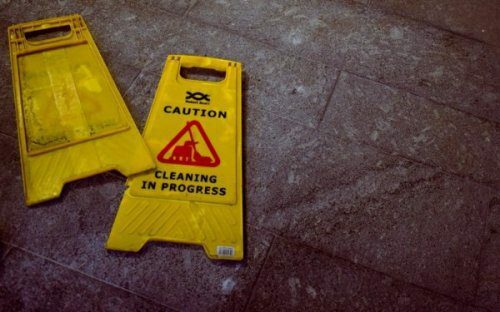 Real world data is dirty, and we as a data scientist—aka data cleaner sometimes—should be able to perform data cleaning prior to any data analysis or models building to ensure the the maximum quality of data. Long story short, after being in data science field for quite some time, I do feel the pain of doing data cleaning before dealing with data analysis, visualization and models building. 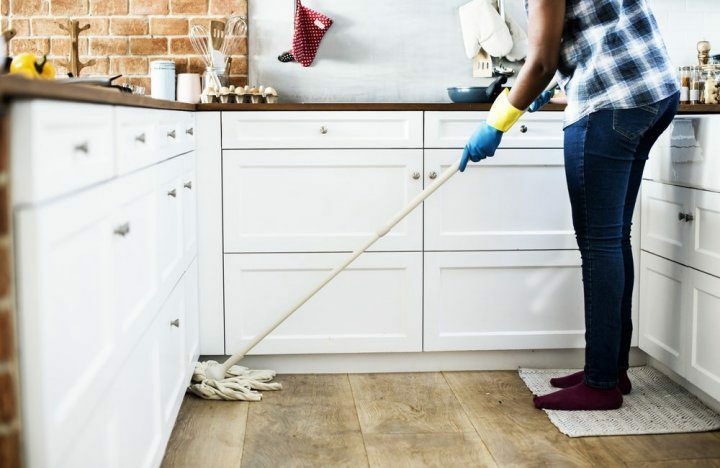 Admit it or not, data cleaning is not an easy task and most of the time it is time-consuming and tedious, yet this process is too important to be neglected. data cleaning in a more smoother way. Why is This Article Important to You? 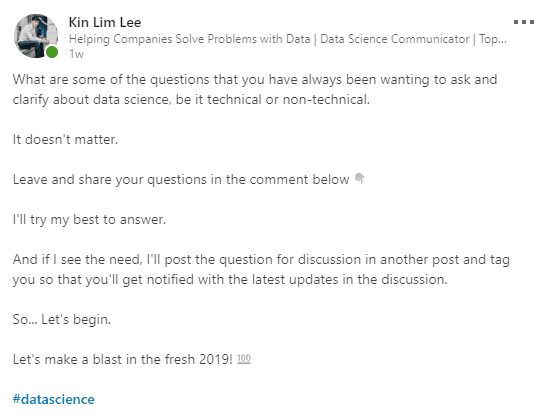 One week ago, I posted on LinkedIn to ask and answer some of the burning questions faced by aspiring data scientists and professionals about data science. So I got a few interesting questions in the comments. However, there was one particular question posted by Anirban that I eventually decided to write an article to answer that question since I’ve been getting the similar questions from time to time. In fact, not long ago I realized that some data had similar patterns when it came to data cleaning. And this was when I started organizing and compiling some of the data cleaning codes that I thought they would be applicable to other common scenarios — my little toolbox for data cleaning. Since the common scenarios here span across different types of datasets, this article focuses more on showing and explaining what the codes are used for so that you can plug and play easily. At the end of this article, I hope you’ll find the codes useful and that would make your data cleaning process more faster and efficient. In the following code snippets, the codes are written in functions for self-explanatory purposes. You can always use the codes directly without putting them into functions with a small change of parameters. Sometimes, not all columns are useful in our analysis. Therefore, the df.drop comes in handy to drop the selected columns as specified by you. When a dataset gets larger, we need to convert the dtypes in order to save memory. If you’re interested in learning how to use Pandas to deal with large data, I strongly encourage you to check out this article — Why and How to Use Pandas with Large Data. Some machine learning models require variables to be in numerical format. This is when we need to convert categorical variables to numerical variables before feeding them to the models. In terms of data visualization, I’d suggest to retain the categorical variables to have a more explicit interpretation and understanding. If you want to check the number of missing data for each column, this is the fastest way to go with. This gives you a better understanding of which columns have higher number of missing data that determine your next action of data cleaning and analysis. There might be some time when you’d face the new line character or other weird symbols that appear in your columns of strings. This could easily be dealt with using df['col_1'].replace where col_1 is one of the columns in the dataframe df. Anything is possible when data is messy. It is not uncommon to see there are some white spaces at the beginning of the strings. Thus this approach is useful when you want to remove white spaces at the beginning of the strings in a column. This is helpful when you want to combine two columns with strings conditionally. For instance, you want to concatenate the 1st column with the 2nd column if the strings in the 1st column end with certain letters. The ending letters can also be removed after the concatenation, depending on your needs. When dealing with time series data, chances are we’ll encounter timestamp column in string format. This means we may have to convert the string format to datetime format — format to be specified based on our requirement — in order to give meaningful analysis and presentation using the data. The codes by nature are relatively simple to implement. I hope this little toolbox of data cleaning gave you more confidence to perform data cleaning and more broader perspective of how datasets typically look like based on my experience. Bio: Admond Lee is a Big Data Engineer at work, Data Scientist in action. His current roles are at Micron Technology, AI Time Journal, and Tech in Asia. He has been helping start-up founders and various companies tackle their problems using data with deep data science and industry expertise. You can connect with him on LinkedIn, Medium, Twitter, and Facebook.